A vintage newspaper can be a treasure chest of historical gems for family history enthusiasts. 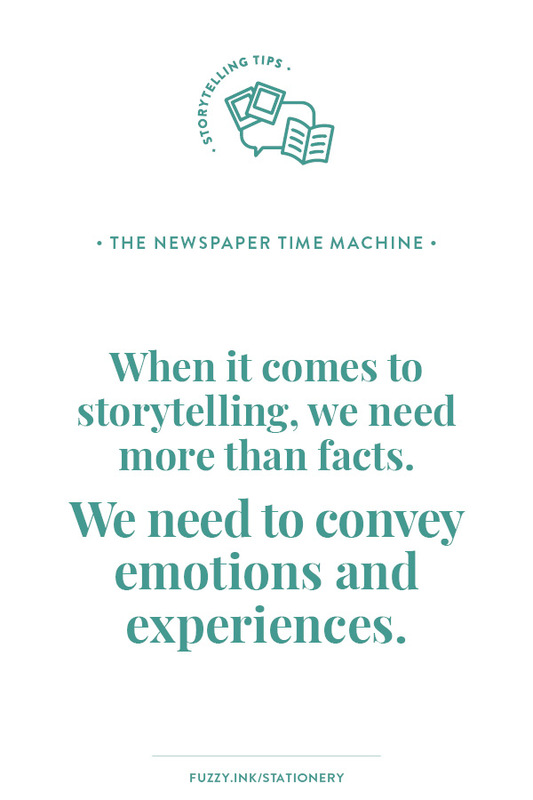 The newspaper has been the keepers of our stories for generations. It provides us with much more than just birth, death and marriage notifications. Papers give a snapshot of what life was like at a particular time. Therefore, giving you a glimpse of what your ancestor saw and experienced during their lifetime. 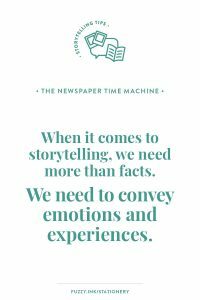 Because when it comes to storytelling, we need more than facts. We need to convey emotions and experiences. And while certificates or records can provide us with details, they don’t show us much more than that. But newspapers do. You are already checking the newspaper for birth, death and marriage notifications. As well as obituaries or checking the social column hoping to see your ancestors’ name. And maybe your even searching articles to see if they pop up there. But a newspaper can tell you a lot more about your ancestor without ever mentioning their name. level of crime in the local area. 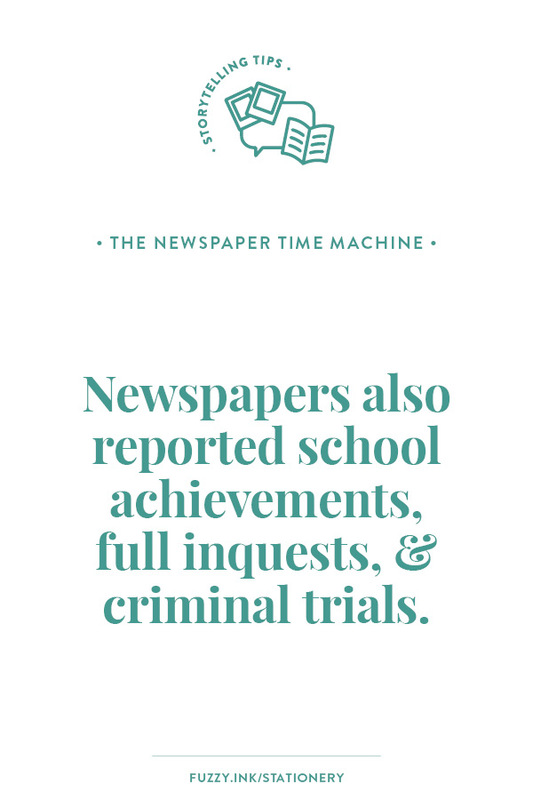 Newspapers also often reported school academic and sporting achievements, full inquests, and criminal trials. All of which provide a unique insight into the past. Newspapers can provide a general overview of an era and significant details of a specific region. Not just from the details but also from the writing style. Something more noticeable before the regular use of photos or illustrations when words had to do all of the work. Usually used for the government or other legal notifications. Therefore it’s a great resource to see the growth of an area. As well as what other changes were taking place in the law and society. Both things would have had an impact on your ancestor. Would they have been excited to see their town developing? Or would the changes have had a negative influence on their lives? If your ancestor was a business owner, then you might get a bonus and find notice of their application. Local infrastructure and services – e.g., a petition to build a post office? 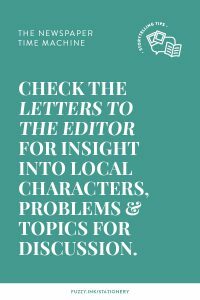 What were the most prominent local concerns, – e.g. were they at risk of natural disasters or a sickness epidemic? 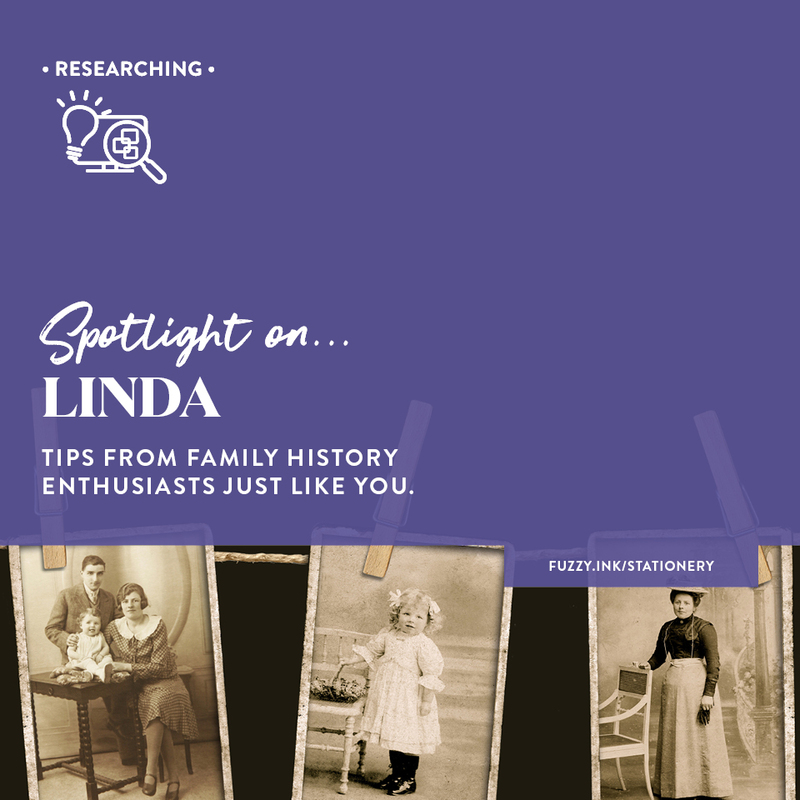 And you might even find your ancestor mentioned as an attendee at a meeting! The lost and found notifications provide insight into what was valuable at that time. It’s a great way to see what was important and what impact losing such items might have. The financial impact of losing that item? Any patterns of loss in the area during a particular era? The general perception of honesty vs dishonesty? For example, if your ancestors’ were farmers, then they would need to purchase seed. There may not have been a store in their nearest town so they’d wait for seed salesman to visit. Due to long distances, the salesman would stay in a hotel in the nearest large town. Therefore the farmer travels to town, and this becomes a major social and shopping event for the family. It may happen only once every quarter and could mean a few days to a week spent in town. So, one small advertisement can indicate something that was a significant influence in your ancestor’s life. 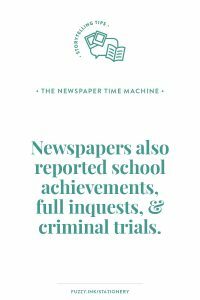 Newspapers would often report inquest findings, most significantly for spectacular cases such as an unexplained death or murder. You can learn a lot about what was happening in the local area and the influence it had. Was there an epidemic, a murder or even a serial killer? It sounds dramatic, but rumours of a local serial killer can influence people lives. Even deaths that were far away may still impact locally. Horrific or tragic deaths can influence our lives by changing our perceptions of safety. 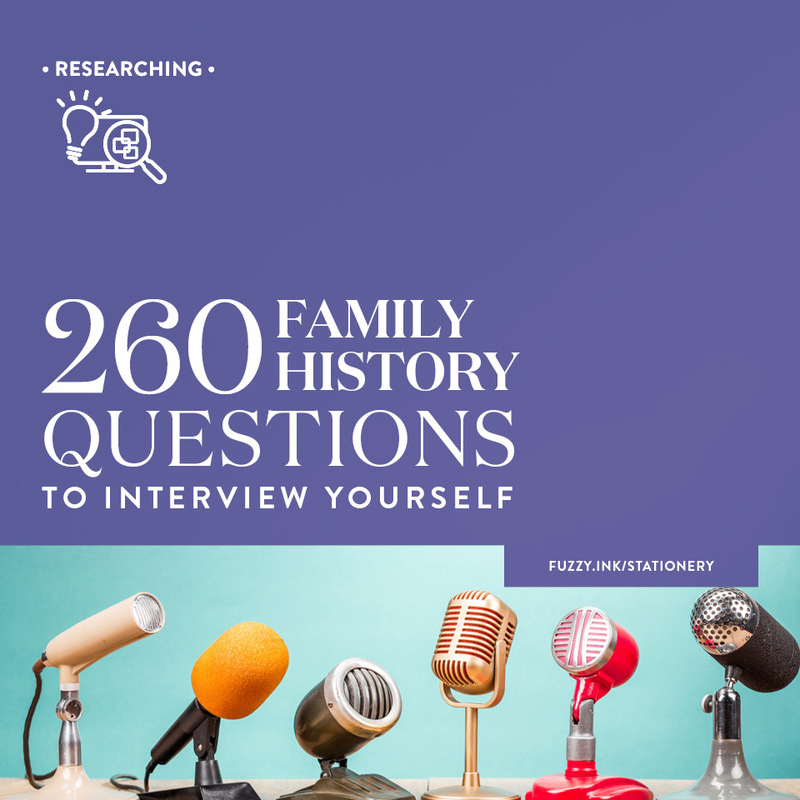 Was there anything that might have had an impact on your ancestor? Then you can contemplate the impact would these trials have locally. You might even discover familiar names from your research, (e.g., neighbours, friends, etc.). Or maybe even your ancestor. 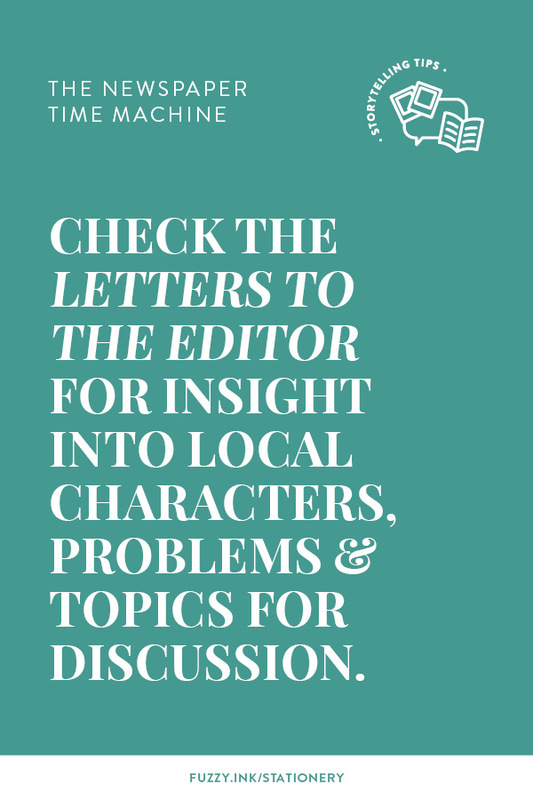 When using the newspaper for storytelling, you’ll want to read the letters to the editor. These give great insight into the characters, expectations and what was troubling the locals. As well as a variety of other ongoing local matters. These will only be relevant for port-based cities or towns. These notifications can tell you about the industry and activity that was happening in the area. Was regular transport arriving and leaving? Were any cargo only ships? Weather can have a significant impact on our lives, and it was more so for our ancestors. Because for many of them, their food source was what only they could grow. The personal column was a little different back when your ancestor was reading the newspaper. There may not have been telephones, and not everyone had a permanent address. So, the personal column became a way to send messages to family and friends. It was often a request to visit the post office to collect a letter or to get in touch. One of the best sections when using newspapers for storytelling is the classified ads. It’s a fantastic snapshot of the products available at that time. You can tell a lot about an area from what people are buying or selling. Compare the classifieds to similar retail advertisements for insight into the cost of items and what was affordable. Remember that your ancestor probably fixed things instead of throwing them out. And just like today, the price was a significant consideration when it came to purchases. The property section is another great way to get a feel for the cost of living for your ancestor. Find out the cost of renting vs. buying in the area they lived. What type of property was affordable? Was it a good area? Did your ancestors rent or buy their place? 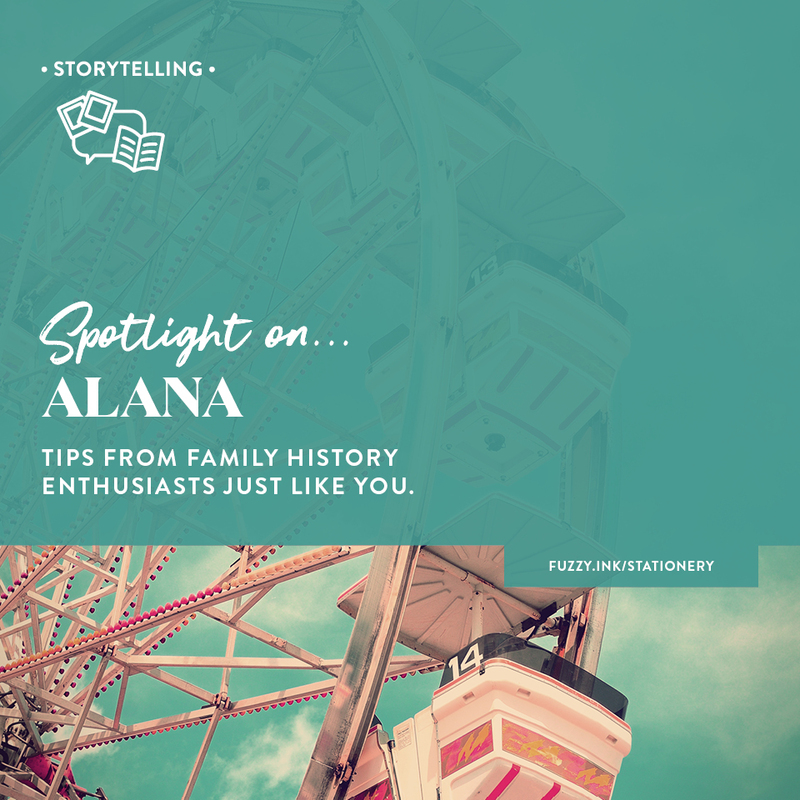 These events create a picture of local society, and what your ancestor did for fun. Would they have attended local dances? Or perhaps they were a participant in local theatre? the type of businesses or individuals who might have been their employer. These are fourteen common sections that I’ve seen from years of reading vintage newspapers, but there are many others. 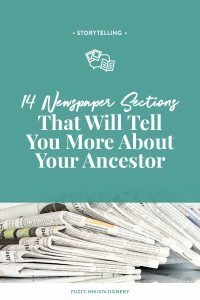 Some are region or country-specific so check your ancestor’s local newspaper and look at what you can find. As well as anything else that catches your eye. Then use this new data to add colour and depth to your writing. And you never know, you may find your ancestor lurking in other places in the paper as well. 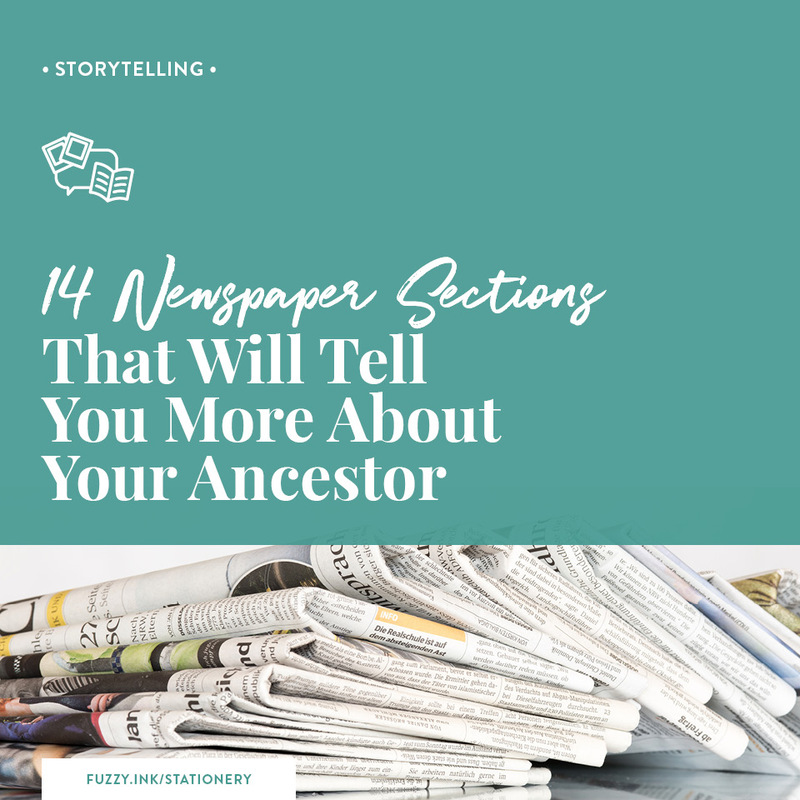 How do you use historical newspapers to find out more about your ancestor?